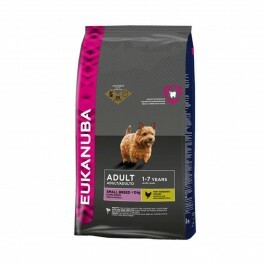 Eukanuba's food for Adult Small Breeds is ideally suited to the small breed's higher metabolism and smaller stomach and is recommended for small breeds such as: Yorkshires, Pug, Bulldogs and Maltese. This food has clinically proven antioxidants, to help build your dog's natural defences. It also inlcudes an approproate ratio of Omega-6 and 3 fatty acids, to promote a healthy skin and radiant coat and has been proven to help reduce shedding by up to 80%**. The use of high quality, animal-based proteins (chicken is our No1 ingredient) are clinically proven to help maintain strong and lean muscles. It is formulated with prebiotics and clinically proven beet pulp, to help keep your dog''s digestive system healthy and to optimize nutrient absorption. This diet has been developed with veterinarians and is recommended by top breeders, to give your dog a 100% complete and balanced nutrition. In addition, the use of 3D DentaDefense technology will help to clean your dog's teeth with every bite - reducing tartar build up by up to 80%**. * vs. Eukanuba Adult Dry Dog Food for Medium Breed. * For dogs > 10kg we recommend to feed Adult Medium Breed and for dogs > 25kg Adult Large Breed. Your dog may eat more or less depending on age, temperament and activity level. Best use with our healthy biscuits for adult dogs.